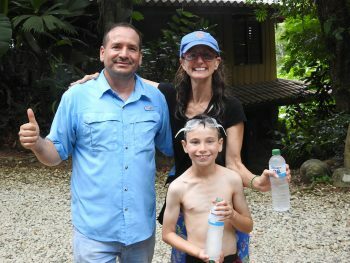 We had a wonderful second trip to Costa Rica in early July, this time exploring the Pacific coast; despite our traveling during the rainy season, the weather was, once again, phenomenal, allowing us to do all the adventures we wanted to. Leo picked us up at the airport and was our guide for the first couple of days of our trip before handing us off to Jose Pablo for the remainder of our adventure. Leo was such a kind, thoughtful and big-hearted gentleman and shared with us his incredible knowledge of botany during his time with us including natural remedies for mosquito bites and even stopping by a roadside fruit stand so we could sample some novel edibles. We spent our first couple of days in the Manuel Antonio area, staying at Costa Verde hotel for two nights–for ‘simple’ ecotico lodging it was pretty spectacular; the ocean view itself was stunning. On our first full day, we did a morning kayak tour through the mangroves out of Damas which was fun and then spent most of the rest of the day relaxing at Playa Biesanz since everyone was ready to get in the ocean and have some beach time (it was highlighted by troops of monkeys in the trees and some spectacular birds in the surrounding woods). The following day we explored Manuel Antonio National Park with Leo as our guide and were treated to some fine sloth encounters (among other mammals and birds). After that, we headed off to Uvita for one night at La Cusinga lodge, another lovely site with the most amazing yoga house; we could have easily stayed here longer. We had a fun (though a bit treacherous) hike from the lodge down to the beach which we had completely to ourselves; it was a stunning location what with the crashing waves on one side of us and the jungle escarpment on the other—it seemed like something out of the movies! The following morning Jose Pablo arrived and we had a little ‘family’ renunion as he was our guide on our first trip to Costa Rica; we love Jose Pablo and felt that we just picked up where we left off last year! We traveled to Sierpe then hopped on the boat to our lodge, Las Caletas, on Drake Bay. Again, the lodging was wonderful and we practically had the whole place to ourselves! Our 9 year old son befriended the 8 year old daughter of the lodge owner and so we had some additional company for our time at the beach, some walks along the ocean-side trails and some local birding (not to mention several bilingual games of Go Fish). Our son was delighted to have a companion his own age! The scenery at Las Caletas was amazing, as was the food; the chef at the lodge was top-notch, serving what could only be described as edible works of art for dinner; it was really the most amazing food! Apart from hiking some of the local trails around the lodge (replete with bird life enjoyed with a background soundtrack of howler monkeys), we also took a boat taxi (seeing dolphins on the way) to Corcovado National Park for a guided nature tour (and lunch) there. Tapirs, coatis, and agoutis were hits on the mammal parade and, of course, a nice diversity of bird life made for a fun nature hike. 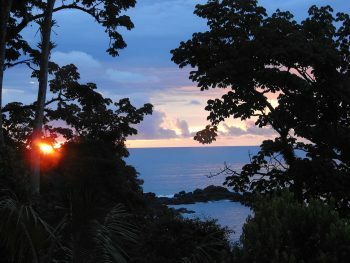 Drake Bay was a great mix of ocean, jungle, fine food and relaxation; we’d highly recommend it! We said goodbye to Las Caletas and had a fun boat ride back to Sierpe and then headed to Hacienda Baru, which we also loved. It had some great hiking trails and another spectacular beach, though we didn’t swim there given the rip currents (we just frolicked in the pool and watched the local iguanas try to eat our Crocs). 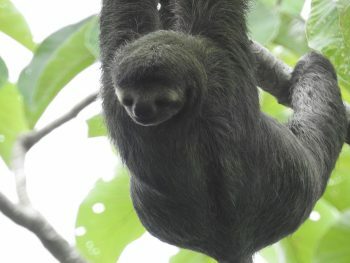 We had some more wonderful sloth encounters at Hacienda Baru along with some fine bird sightings along the trails. We went into Dominical a couple of times for lunch/dinner and, of course, to watch some world cup soccer matches with the locals (and also watch the surfers). 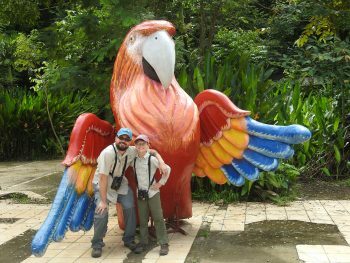 On our way back to Alajuela the next day, we stopped for a few hours at Carara National Park for a great final nature hike and had some amazing bird encounters (toucans, macaws, tanangers, and a forest falcon not more than 10 feet away!). It was a great way to end our trip. We said ‘hasta luego’ to Jose Pablo (knowing, of course, that we’ll return and see him again) and then headed home. In the end, the only way the trip could have been better is if we could have stayed longer. Pura Vida! Thanks for all of your work arranging another fine trip for us; it was a blast.